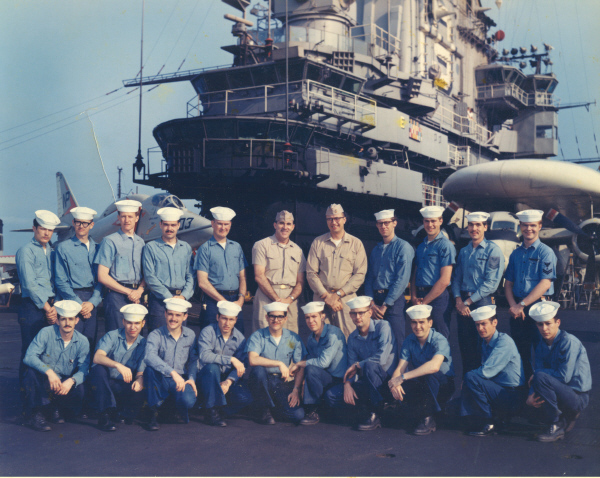 Personnel from the USS Hancock photo lab pose for a group shot. Entire photo lab not present in photo. Front (L-R) PH3 G.A. Langley, PH2 D.Marcus, PH3 T.N. Ludden, PHAN R.T. Gonsalves, PH2 B.L. Benet, PH3 G.L. Osborne, PH1 J.D. Callison, PH1 T.G. Alsop, PH1 R.H. Miller, PH2 C.R. Pfeiffer. Back Row (L-R) AA J.A. Pingel, PH3 L.A. Howe, PH2 F.J. Hawks, PH3 K.R. Dean, PH1 G.A. Worthington, LT. A.R. Thompson, PHC M.T. Postolan, PH2 T.S. Aubry, PH3 R.J. Foster, PH2 S.M. Johnson, PH2 M.E. Mowbray.